^ Zahn, R. "Garum". Real-Encyclopaedia der klassischen Altertumswissenschaft 1st Series. 1912, (7): 841–849 （德语）. ^ Robert I, Curtis. 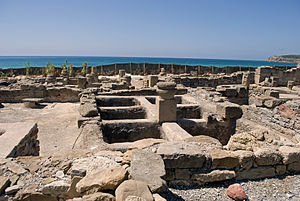 "In Defense of Garum". The Classical Journal. 1983, 78 (3): 232–240 （英语）. ^ Rober I., Curtis. The Garum Shop of Pompeii. Cronache Pompeiane. 1979, XXXI (94): 5–23. Atik, S. "Marcus Gavius Apicius ve Garum" III-IV. Ulusal Arkeolojik Arastirmalar Sempozyumu, Anadolu / Anatolia Ek Dizi No. 2 / Suppl. Series No. 2, 15–25, Ankara, 2008. Butterworth, Alex and Ray Laurence. Pompeii: The Living City. New York, St. Martin's Press, 2005. Downie D (2003) "A Roman Anchovy's Tale" Gastronomica - The Journal of Food and Culture, 3 (2). Smith AF (1998) "From Garum to Ketchup. A Spicy Tale of Two Fish Sauces" Pages 299–306 in: Harlan Walker (Ed.) Food from the Waters, Proceedings of the Oxford Symposium on Food and Cookery 1997. ISBN 9780907325895.